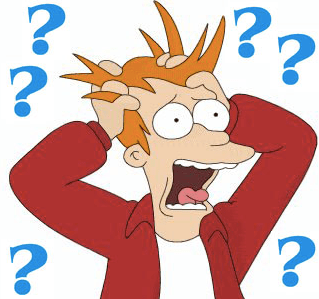 Let me begin by saying that shipping a vehicle overseas can be a logistical nightmare; there are so many pieces to the puzzle it will make your head spin. I’ll give it a whirl to see if I can make it clear enough to make sense of it all. Private shippers, meaning those who do not have a license with a shipping company to utilize their services (like us), must use an “licensed agent” to coordinate all shipping logistics. 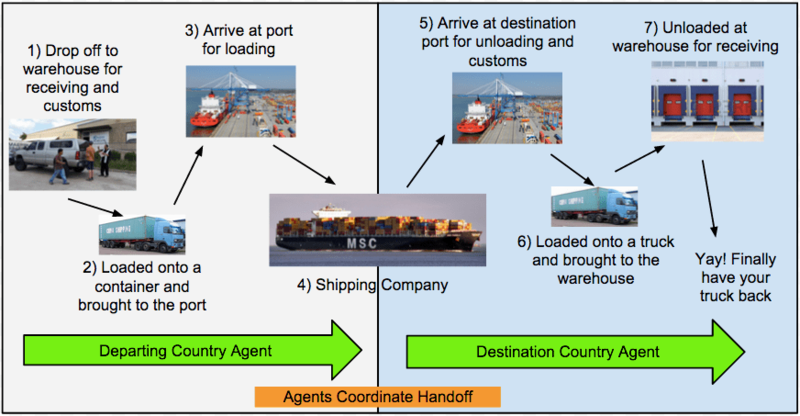 Remember that there is a departure port and an arrival port, therefore you are required to have an “agent” at each; and yes you guessed it, that is a separate payment, I mean, agent per port. The hired agent is the single point of contact for the drop off warehouse, container packing, trucking company (carrier), the departure port and the shipping company itself. Keep in mind you are working with dual agents, one from each country, so in the end you’re essentially coordinating 7 companies to get your vehicle overseas from point A to B. Here is a little sketch to put it into perspective…. We felt as though a brief explanation of the over all process was necessary before giving an update as to where we are in reuniting our beloved truck; so I hope that helps. When we dropped off Hermes at the warehouse for receiving and customs it was quite sketchy but we were assured everything was okay and on track by our agent. We spent the next few days in Houston tying up loose ends and catching up with friends, assuming everything was going according to plan. Upon arrival our arrival in Buenos Aires we got through our first hurdle of getting Lucia, our 2 year old foxhound/cattledog, out of customs and felt like things were off to a great start. I contacted our agent to confirm the expected arrival date only to find out that they were having significant issues with the receiving warehouse who missed the customs deadline in order to make our expected ship out of Houston (1 week delayed). Adding insult to injury, the warehouse failed to inform our agent that they missed the cut off and were having additional issues with “the paperwork”, so they claimed, and were not able to get our container cleared in time for the next ship out the following week (2 week delay). I immediately began micromanaging the situation, to include calling customs on my own to find out what the issue may really be. At this point patience was beyond thin and I went straight to the owner of Sea and Air Experts; he informed me that he was changing the warehouse, carrier and shipping company all together to assure our shipment would be on its way. However, it wasn’t over, yet another speed bump: Labor Day! (additional 3 week delay). Ok, deep breath, it will be okay, we are in Buenos Aires – we are trying really hard not to complain but, begrudgingly, days and budget tick by. Our agent assured us we were cleared for the next ship scheduled: September 15th, 2015. The paperwork was submitted and the truck completely cleared through customs on a ship stamped for anytime on or after the 15th of September. Low and behold, the shipping company was running ahead of schedule and moved the sail date to September 13th. Our paperwork was stamped for the 15th, and already within the 72 hour window couldn’t be changed (4 week delay); so yes, you guessed it, yet another week. Having made our lodging arrangements for the original ship date we are now checking out the day the truck was supposed to arrive and it’s still sitting in Houston, not scheduled to depart for another week. The blows to the chin keep coming. After four weeks of delays our truck is finally confirmed as loaded on the “Monica” shipping vessel leaving Houston, TX for Buenos Aires on September 22! We are thrilled with anticipation of its arrival…we just hope everything is in place on the Argentinian side and things go much smoother! The search for the right overlander is important because it is going to be your ‘home‘ for an extended period of time. Your ‘home’ needs to be reliable, safe and of course rugged enough to get you where you want to go. Some will suggest that when traveling international you should be inconspicuous, try not to bring attention to yourself. However, as a 6’3″ red-head we feel like we are going to stand out no matter what so we might as well travel comfortable and enjoy our ride. 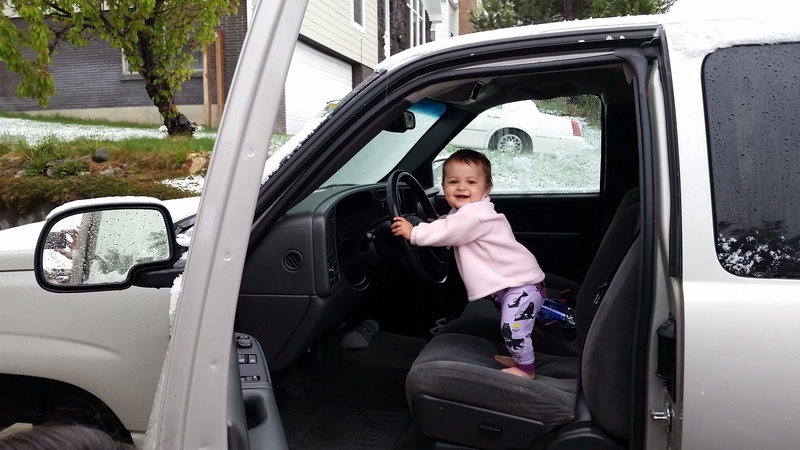 We began the search on craigslist within our home state of Colorado; scouring posts for a sportsmobile, truck or whatever would fit our travel needs. Although a sportsmobile seemed like a great option it was either a bit more than our budget would allow or the amount of work needed to get it up to long haul condition would have broken the bank. As the weeks went on our search began to widen to the point where we were looking nationwide. 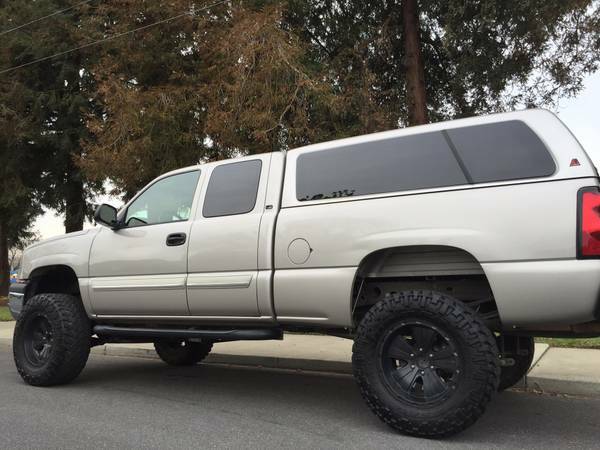 Finally, a Silverado 1500 with low miles appeared. The truck was in excellent condition, meticulously maintained and had the start to what we wanted for our trip. 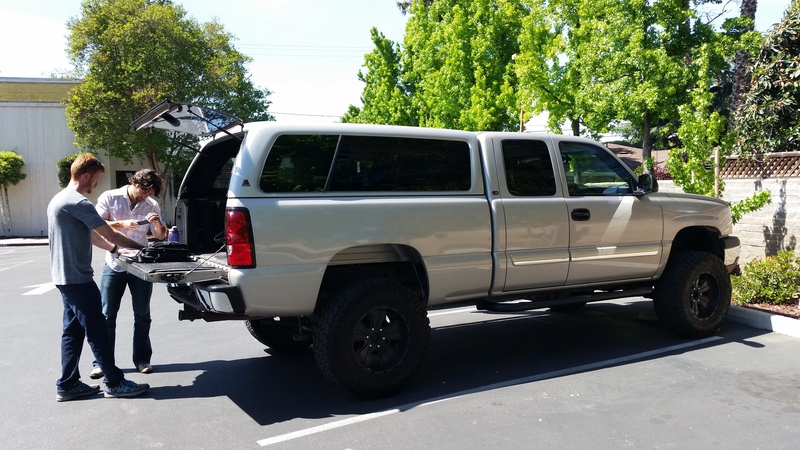 After 8 long weeks of searching for our house-on-wheels we decided to go for it and take a risk on the sight-unseen Silverado – the major hitch being that the truck was in California. After several, several days of negotiations we bought one way tickets to San Jose and rolled the dice. After some of the conversations and the seller’s request that we make the transaction in cash we had a lot of logistics to work through and some doubt that the sale would in fact take place. Buying and selling a vehicle on Craigslist can be risky and this seller was concerned enough to put us through some hoops. We arrived and made our way over to the meeting place check in hand and putting our trust in the seller to make this all happen. We knew exactly who he was when he drove by, the truck is a beautiful beast. Besides being awed by the truck, we were also intrigued by this guy; strolling up looking like Hollywood. He even stopped the young waitress in her tracks and never before have either of us seen someone stumble for words like she did, we still laugh about it. I asked what he did and he said a family mental health professional, “Changing the world one family at a time”. But mostly he’s an avid climber, he had just returned from climbing El Capitan. Off we were on a test drive and to the bank to finalize the deal. Everything checked out and we were anxious to get on the road. This was a quick trip with three long days of driving to make it back to work on Monday morning. We were sent on our way with an admiration of our courage and we were pleased to have the first major logistic of finding our Overlander that we now call ‘Hermes’, a reference to the God of land travel. Moore Pics Please. . . .